Bridal Gowns are very precious in many ways. Not only is it an expensive purchase but it holds very special memories. From the first time you tried on your dress in the shop and knew it was the one, planning and organising, the stresses and worries, nervous sticky palms, saying your vows, your first kiss as a married couple through to your first dance. To preserve your wedding dress and its memories it is essential that you have it cleaned and stored in a very particular fashion to prevent fading, damage and ageing! If you take your Bridal Gown to a non-specialist gown cleaner many disastrous things can happen like beads will melt with the wrong solvent, glue for sticking diamantes will dissolve and paints will run or fade. Our Baptiste Process® is specifically designed to clean these types of trim and designs without any problems keeping your gown in pristine condition. The Baptiste Process® is gentle enough to cope with anything that wedding gown Designers can dream up! 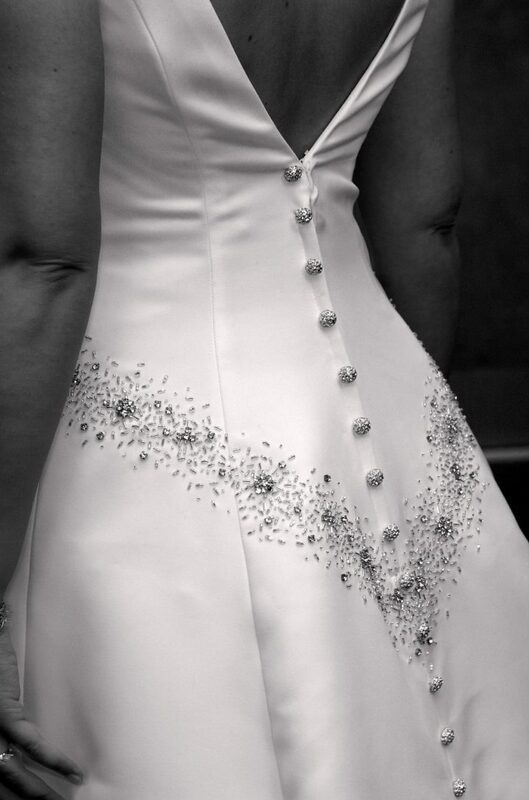 We specialise in cleaning ONLY Bridal Wear therefore our solvent is kept pure & clean at all times. Our Specially Formulated Baptiste Process® is suitable to clean any Wedding Gown including silk, delicate, embellished and hand painted Gowns. We cater for all Gowns including those labelled: Specialist Dry Clean, Spot Clean, 'do not dry clean', 'Baptiste Process® (this is our own registered Process) and even those that do not carry a cleaning label. As the ONLY Specialist Bridal Gown Cleaner using the Specially Formulated Baptiste Process® we guarantee your satisfaction! We are a family run Business with over 50 years in the Dry Cleaning Industry. Treating every Gown as an individual with the Care and Attention it deserves. No matter what the cost every gown is precious in its own way. Our Baptiste Process® has quickly become a standard of excellence endorsed by the Trade and our Care Label is used by many major Bridal Gown Manufacturers and Retailers such as Ian Stuart, Hollywood Dreams, Berketex Bride, Eleni Bridal, and many more. Have a look, you may even find our Care Label inside your Gown! Our unique Baptiste Process® is what makes our service stand out from the competition. You can order your gown and garment cleaning services online right now, and select from a range of beautiful heirloom storage boxes. Don't just take our word for how good our services are. Read from some of the testimonials and thank you letters we've received from happy brides.